Health care professionals answer a crucial calling. They take an oath to serve humanity in all of its complexities, mysteries and surprises. From the boardroom to the classroom, HPU’s values-based education has prepared thousands of graduates to lead in relevant fields. The next transformational journey will also prepare future leaders for the health care careers of tomorrow, meeting the growing demands for practitioners around the world. New faculty, facilities, technology and curricula are being put into place now for physician assistant, pharmacy and physical therapy programs, all slated to launch in phases. It began this year with PA studies. According to the Bureau of Labor Statistics, these fields will grow up to 38 percent in the next 10 years, well beyond the average rate of job growth for other professions. These programs will put HPU students at the heart of medical research and patient care as graduates enter a world with a high demand for health care providers who can tackle challenges in a changing landscape. They’ll treat individuals across the world as they enhance our quality of life. It’s a journey that starts on this campus. HPU’s School of Health Sciences, which already houses undergraduate and graduate programs in exercise science and athletic training, launched a new Physician Assistant Studies program this summer. The program equips students to work in a field where 78 percent of graduates have multiple job offers, according to the National Commission on Certification of Physician Assistants. The Department of Physician Assistant Studies is currently next to the Department of Physical Therapy and its Human Biomechanics and Physiology Lab. The two departments will move to the $88 million School of Health Sciences and School of Pharmacy building upon completion in 2017. Two medical simulation labs in the current PA facility feature leading technology. This includes four high-fidelity, wireless mannequins, one of which gives birth to a simulated baby. Stan, a male mannequin that appeared in a “Grey’s Anatomy” episode, can talk, bleed, cry, convulse and respond physiologically to scores of intravenous and inhaled medications. Faculty in an adjacent control room can alter Stan’s physical responses to students’ actions, causing him to have increased heart rate, change in temperature, allergic reactions and much more. 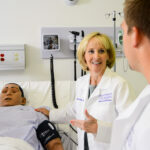 Dr. Linda Sekhon, founding chair of the Department of Physician Assistant Studies, says that incorporating high fidelity mannequins into the classroom allows students to practice providing clinical care to a patient without risk. In addition to the medical simulation labs, the department includes three patient exam rooms for working with live patients, rooms to facilitate problem-based learning, and a clinical skills lab for demonstration and practice of medical techniques such as suturing. Sekhon says the outstanding facility and faculty in place rival top PA programs around the country. Hailing from prestigious PA programs at Duquesne University, the University of New Mexico, Wake Forest University, Indiana University and others, HPU’s faculty have been recognized for their excellence in teaching as well as their expertise in health care. 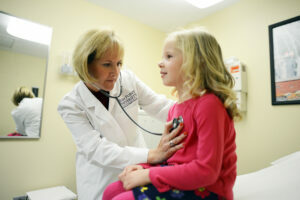 Their experience in medical specialties includes rheumatology, pediatrics, orthopedics, urology and family medicine. As the program grows, they will represent hundreds of years of combined experience. 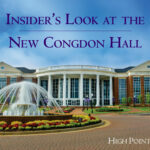 High Point University is located in the Piedmont Triad region of North Carolina — a hub of medical innovation. Featuring renowned hospitals and medical systems, it is a prime location for HPU’s new health sciences and pharmacy programs. Faculty in these programs are building relationships with the robust population of physicians and health care providers surrounding the university to ensure students have access to clinical rotation sites and experiential learning opportunities in close proximity to their campus. For the Physician Assistant Studies program, which recently welcomed its first cohort of students, 53 percent of clinical sites are within 5 miles of campus, while 97 percent of clinical sites are within 25 miles. Whether students major in physician assistant, physical therapy or pharmacy studies, they will have access to leading medical facilities and mentors in their community as well as on campus. 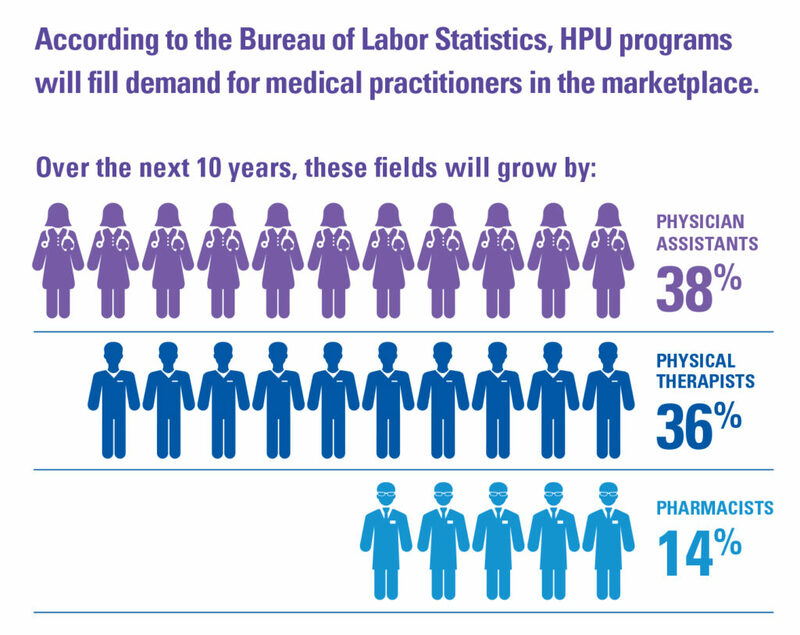 Soon, students of High Point University’s School of Pharmacy will get hands-on experience that prepares them to care for and communicate with patients on a daily basis. 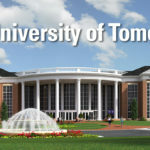 Dr. Ronald Ragan, dean of the School of Pharmacy, who previously developed new classroom and experiential opportunities at the highly respected University of Kansas School of Pharmacy, is leading the development of HPU’s new school. He has more than 25 years of experience as a community and hospital pharmacist and educator and holds a Ph.D. in pharmacology and toxicology. Ragan and newly appointed faculty have developed a curriculum for the six-year program that connects community pharmacy roles with basic science and clinical skills. It is currently being reviewed by the Accreditation Council for Pharmacy Education. He notes that it is a critical time in the field as pharmacy is evolving quickly, presenting new opportunities and new challenges. 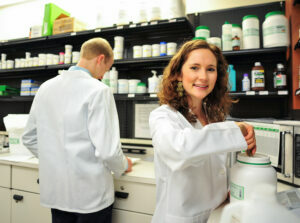 By the time they graduate, HPU pharmacy students will be well-prepared for the workforce. They will go through a traditional two-year pre-pharmacy program, benefiting from the liberal arts education High Point University provides. Then they begin a four-year professional program, the final year of which is spent in the field going through a series of nine, one-month clinical experiences. Faculty are also building a research department for the school that will serve as a core component of the curriculum. The research will focus on discovering new molecules and medications, as well as better ways to treat patients with existing medications. “Our research department will provide teaching opportunities for students, but the research conducted there will also have an impact on the drug therapy options that exist in our health care system,” says Ragan. Physical therapists have seen the passion that aging baby boomers have for staying active. No longer do individuals retire to a rocking chair. Today, they retire to a life of physical activity and adventure. 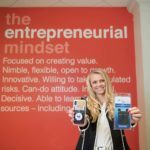 Helping those individuals stay mobile and accomplish their dreams is crucial as the graying population of America increases. Physical therapists accomplish this by enhancing athletic performance, rehabilitating injuries and researching injury prevention techniques to prevent problems before they begin. In short, physical therapists are experts in restoring, maintaining and improving function. “There is a definite need for health care that addresses these issues in every state and in countries around the world,” says Dr. Dan Erb, dean of the School of Health Sciences. Dr. Eric Hegedus, founding chair of the department who hails from Duke University, leads the PT doctoral program development, which is scheduled to accept its first cohort in 2017. He’s put together the two most important pieces of the program: faculty with distinguished credentials and technology that’s second to none. The esteemed professors come to HPU from institutions including Duke University, Johns Hopkins University, Cincinnati Children’s Hospital and the University of Otago in New Zealand. They have achieved major milestones in their careers, such as publishing hundreds of peer-reviewed research articles, some of which were co-authored by current students, on topics ranging from shoulder pain, hip damage, ACL tear/injury prevention, balance and much more. At HPU, these professors remain practicing physical therapists who see patients in the community while also mentoring undergraduates in research and conference presentations. Their work is widely published and relevant to individuals of every demographic. A combination of renowned faculty and innovative technology make HPU’s Human Biomechanics and Physiology Lab unique, so much so that it’s attracting professional athletes like NFL players Corvey Irvin of the Detroit Lions and William Hayes of the St. Louis Rams. 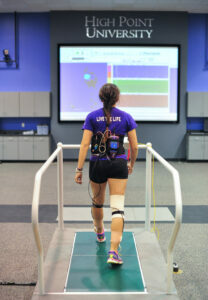 Irvin discovered the HPU lab through his personal trainer while undergoing rehabilitation for a high ankle sprain. He had just been released by the Chicago Bears, but he refused to let the setback end his career. He sought the expertise of Dr. Alexis Wright, assistant professor of physical therapy, and Dr. Eric Hegedus, chair of the department of physical therapy. Guided by their knowledge, Irvin recovered and became stronger. The professors used an innovative rehabilitation strategy along with specialized equipment, such as the anti-gravity treadmill. Only found in the world’s best facilities, the treadmill allowed Irvin to run at a small percentage of his body weight without any pain. 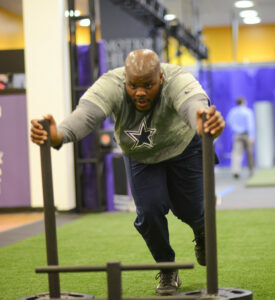 Weeks later, the hard work performed in the lab paid off on the field as Irvin signed with the Dallas Cowboys. In 2014, he joined the Detroit Lions and played as their defensive tackle. This is one example of the ground-breaking work faculty in the lab and their undergraduate majors are now performing. From NFL players to weekend warriors, they’re advancing the way athletes and all individuals stay active longer. They’ve welcomed other professional athletes to the lab such as Hayes, defensive end for St. Louis. Two students worked with Hegedus to host a women’s golf study in the lab for female golfers in the community. The study focused on two types of strength training workouts to determine which most effectively improved their game. Hegedus and the students, recent graduates Kelly Hardesty and Andrew Fisher, analyzed the final results for publication. They found both groups of women improved bone mass and decreased body fat in the process — a win for all involved. 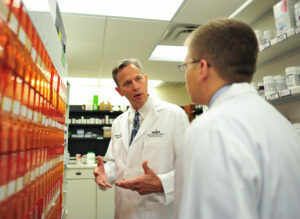 Students studying health sciences or pharmacy at HPU won’t just be learning how to provide care. They’ll learn how to provide patient-centered care, an approach that requires a team of health care professionals to work in unison to provide the most effective treatment. When the physician assistant makes a diagnosis at your doctor’s office, they write a prescription that’s transferred to your pharmacist. Both provide instructions for your treatment. In some cases, you’ll meet other providers along the way, creating a complex regimen. The key to success is their ability to communicate and work together as your health care team. 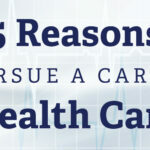 In the real world, health care providers don’t practice in silos. They interact daily, and their patient’s well-being depends on their ability to communicate and collaborate effectively. The curriculum and facilities of HPU’s programs are intentionally designed to reflect the working environments of the future. Physician assistant, pharmacy and physical therapy students will participate in real-world scenarios in their studies before beginning clinical assignments at health care organizations, where they’ll put their practice into motion. 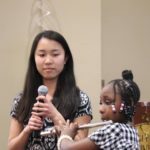 By the time they graduate, problem-solving and working across disciplines will have become second nature, along with improving the lives of their patients.